Named after its discoverer, Howlite is a borate mineral that is often polished and tumbled for collectors and fans of this inexpensive stone. 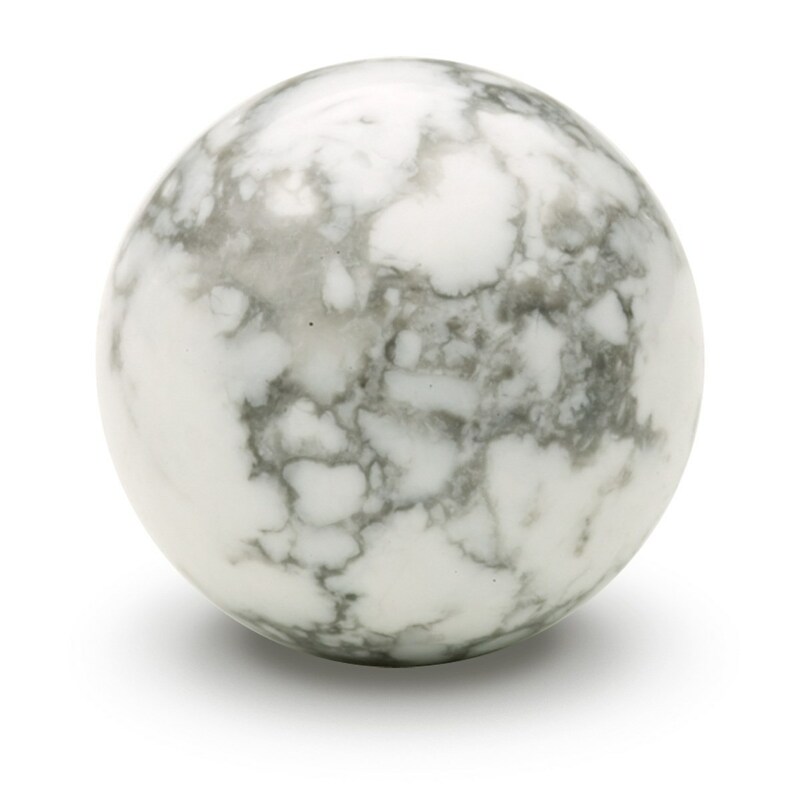 Howlite is nicknamed the porcelain-like gem because of its white stone appearance. It is commonly dyed different colors, normally turquoise to create an imitation of another popular gem. 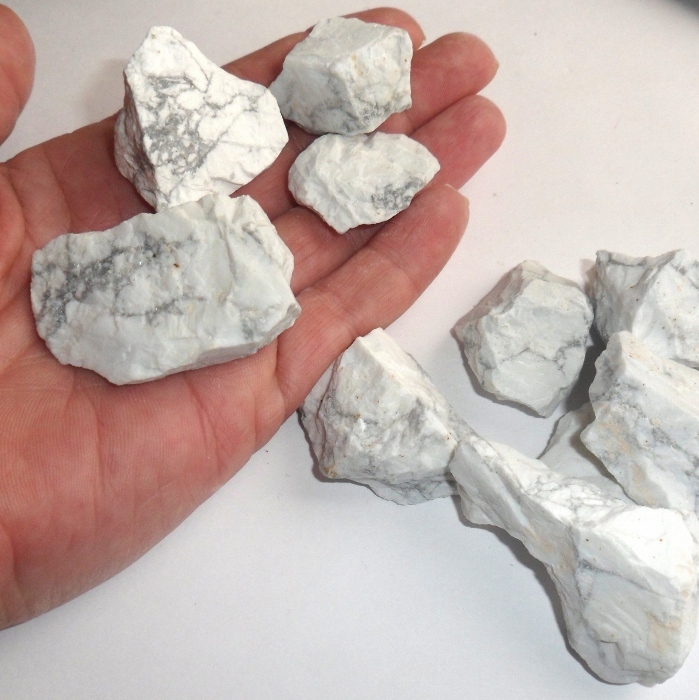 Learn more about howlite’s properties, how to care for your stone, and where it’s mined today. Howlite is a borate mineral composed of basic calcium silico-borate. Its chemical formula is Ca2B5SiO9(OH)5. It gets its nickname from its white marble or porcelain appearance. White the gem forms in large masses that represent cauliflower like nodules. These nodules have a slightly rough texture similar to unglazed porcelain. Depending on its quality, it could appear to have brown markings. Rare formations of howlite can appear translucent and opaque. However, only small nodules of these form have been found. Howlite’s texture is extremely unique. The gem is not suitable to be faceted. Instead, it is cut en canochon or fashioned into other shapes, such as egg shaped or ovals. Because of this popular cut, the stone is commonly used as an ornament and carved into intricate designs. With such a unique porous texture, white howlite can be easily dyed. Some jewelers use this to their advantage and dye the stone to resemble turquoise or red coral jewelry to make an extra profit. However, reputable dealers will disclose if the gemstone has been treated or altered in anyway. Howlite can also be coated with resin to make it harder and less likely to break. Even if the gem is untreated, it can still make a very attractive piece. Howlite was discovered in 1868 in Nova Scotia by a Canadian geologist. The gemstone was named by the geologist, Henry How. How had went on a mission to find the mineral after hearing rumors of its existence from gypsum quarry miners. Apparently, its durability made it hard for the miners to get to the gypsum. When Henry How discovered the stone, he named it silico-boro-calcite. However, the name was changed to howlite by James Dwight Dana shortly after this in honor of its discovery. It has gone on to have quiet existence and is relatively unknown by many, despite being used more than you might realize. Howlite’s meaning is very relevant in the realm of meditation and spirituality. Howlite is also the birthstone for the astrological sign, Gemini. It is important to note that howlite is easily scratched. Because of this, there is no need to use harsh jewelry cleaners. In fact, experts recommend simply using a gentle soap and water. Make sure to only dry with a soft cloth with gently motions. It is also helpful to avoid wearing the stone while doing activities that could cause it damage, such as exercising or cooking. When putting the gem away, wrap the jewelry in soft cloth or jewelry box. By following these simple tips, your howlite pieces will stay in great shape for many years to come. While howlite has been used numerous times in the history of jewelry, it is usually known for its frequency of imitating other gems. Like discussed above, some jewelers have discovered a way to deceive customers by dying the porous gem stone with dye to make it look like more precious stones, such as turquoise or red coral. This is a perfect example of why it is so important to only purchase jewelry from reputable sources. Where Can We Find Howlite Today? Originally found in Nova Scotia and parts of Canada, Howlite is now found in many locations in the United States, such as Los Angeles. This gemstone can also be found in Germany, Mexico, Russia and Turkey. The rare transparent form of white howlite is only found in a few of these locations, especially Nova Scotia. Howlite is a unique-looking stone that is available throughout the United States. Because it takes dye easily, this gemstone is now a popular option for jewelry or even home decorations. However, it’s easily scratches, so do take our advice into consideration and care for your healing gem. Hey Buddy!, I found this information for you: "Howlite Gem Information: Properties, How to Care for It, and More". Here is the website link: https://accessgems.com/howlite/. Thank you.